Thats why I have teamed up with Infacare to offer one of my readers a chance to win 2 bottles! One is Ultra mild and more for a daytime bath, and the other is a more soothing formula especially for bedtime. 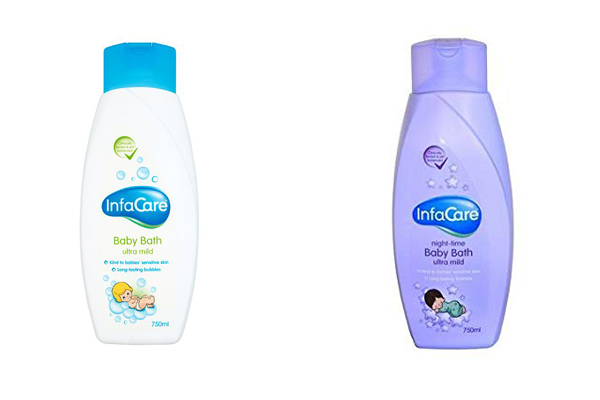 InfaCare baby bath does more than just clean gently, it helps care for your baby's skin too. While also creating some long lasting bubbles for bathtime fun. The prices of Infacare are also so affordable at £2.15 for the 400ml Ultra Mild Bottle and £3.19 for the 750ml bottle. Then the night time baby bath available for £3.49 for a 750ml bottle. These can be bought from from leading stores such as Tesco's and Superdrug. Definitely bath toys. Even being a bit older we still have a bath full, including bath crayons which are the best thing ever. I get lovely messages written in our bath and lots of kisses. My grandasughter loves spashing me with bubbles. My granddaughter loves playing with her toys in the bath. When she come to stay at our house, she plays with our "bath toys" which are actually Adventure Time collectibles. She swaps all the heads and bodies which for some reason she finds really funny. They love the bubbles and new bath products whenever we have them! Most definitely splashing and soaking my clothes and the entire bathroom! The bubbles are a source of fascination. Making 'potions' out of water & shampoo! drawing in the bath with her crayons! The bubbles as they are so much fun. Washing his cars in the bath because he says it's a car wash! My little boys favourite thing about bathtime is splashing me! He likes playing bath games like balancing the penguins on an iceberg.